I preheated the oven to 375°F and prepped my veggies.I heated half the coconut oil over medium heat in a large cast iron skillet and sautéed the onions until soft and translucent.I added the garlic and mushrooms and cooked them until the mushroom moisture had evaporated. Then, I seasoned the filling with salt and pepper and spooned it on a plate to cool to room temperature. For the batter, I beat the eggs in a large bowl with coconut milk, coconut flour, salt, and pepper until well-mixed. Then, I added the sautéed the mushrooms and spinach and stirred to combine. 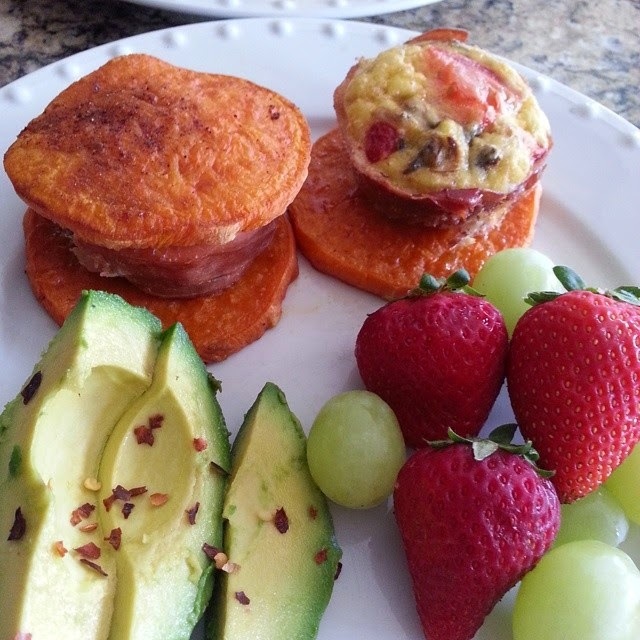 I brushed the remainder of the melted coconut oil onto the muffin tin and lined each cup with prosciutto, taking care to cover the bottom and sides completely.I spooned in the frittata batter, and topped each muffin with some halved cherry tomatoes. popped the muffins in the oven for about 20 minutes,flipping the tray at the halfway point.I let the muffins cool in the pan for a couple minutes before transferring them to a wire rack. Easy, tasty, and portable!